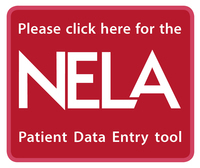 NELA aims to enable the improvement of the quality of care for patients undergoing emergency laparotomy, through the provision of high quality comparative data from all providers of emergency laparotomy. NELA is being carried out by the National Institute of Academic Anaesthesia's Health Services Research Centre (HSRC) on behalf of the Royal College of Anaesthetists (RCoA), in conjunction with surgical and other key stakeholders. Please keep in mind that NELA is on ongoing audit and that the data collection process continues as usual. We would like to thank you for all your continued hard work during the data entry process of this national audit. For more on specific audit objectives, visit our Objectives page. To see the outputs of the audit, please visit our Reports pages. Click here to see your Individual Hospital Performance Indicator Report. NELA QI Videos - Watch the full series of NELA Quality Improvement animations, showing you how to use your data for local improvement. If you have any questions about NELA, please visit our FAQ pages. Please contact the team if you have any further questions regarding this audit. Follow @NELANews on Twitter for the latest news and updates.